Last month at Loading Bar I got chatting with Nick Burcombe, Playrise Digital‘s CEO who is probably most widely known for creating WipEout and WipEout 2097. I also got to play his latest game TTR: World Tour against the development team. 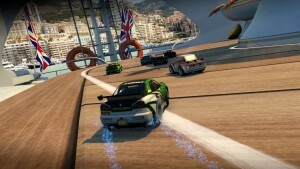 The game itself is an eight-player combat racing game set over 20 tracks, 86 events including a championship mode and different power-ups to mix up the racing. TTR fulfills that old adage; simple to play but difficult to master. Driving the cars around each of the tracks is easy enough with basic controls – accelerate, brake, steer, pick up and fire weapon. Winning races is the hard part. All the weapons, destructible scenery, shortcuts and the deviousness of human players combine to mix up the racing making it hard, but not impossible, for one player to dominate. Even I managed to win a few races against the far more experienced development team. In truth, it took me about 20 seconds from the start of the first race for the expletives to start flying around the bar. I just couldn’t help it. The style of racing in TTR brought back the old memories of playing multiplayer games with friends, smashing each other off the track and compromising your whole race to just to get revenge and make sure your mate couldn’t win. Above all, my abiding memory of playing TTR is the utter satisfaction of hitting an opponent with a perfectly timed ice cube weapon and watch them helplessly slide off the track and wrack their race. Obviously, I wasted many, many ice weapons before finally getting it right and that makes it all the more statisfying. Back in the early 1990’s you had the two-player version Lemmings to instantly hate your friends as they sabotaged all your escape routes and Micro Machines, StreetFighter II, Worms and Mario Kart. Now we have TTR: World Tour to add to the roster of friendship ruining games. In a nice way, of course. TTR is a lot of fun and I’m looking forward to playing it with friends next month when the game is released for PS4. Talking with Nick Burcombe, I asked him to describe TTR and what makes it fun to play. 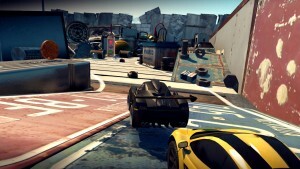 Nick Burcombe: Table Top Racing is a brilliant mashup between toy car racers, Mario Kart viewpoint and with my background in WipEout there’s weapons combat that is synonymous with most of my racing games. The first thing is you look at it and say “Oh, it’s toy cars racing around a track” and the next thing is “What are these weapons all about?” and you can use weapons to counter each other, so there’s a bit more strategy in there. Then about half way through the game there is the unlocking of super weapons which allow you to change the track as certain objects can be moved and destroyed which opens up different shortcuts and routes. The original Table Top Racing on mobile didn’t have any of that as it was a completely static environment. It’s still very good looking and it all runs at 60 hertz and everything but its great to see the team really stretch their legs with TTR: World Tour. It’s not a Micro Machines. It’s not Mario Kart and it’s not WipEout. It’s not any of those things as it’s a munge of all of them [laughs]. Are the tracks custom designed or procedurally generated? NB: Everything is hand built. You are building them with the knowledge that you are going to have 4 circuits on each track, even though it’s one environment. Like the YO! Sushi track which has four different routes through it and they get increasingly technical and complicated. Then you throw into the mix dynamic objects such as they conveyor belt with the little bowls moving round interfering with gameplay and obstructing your view. 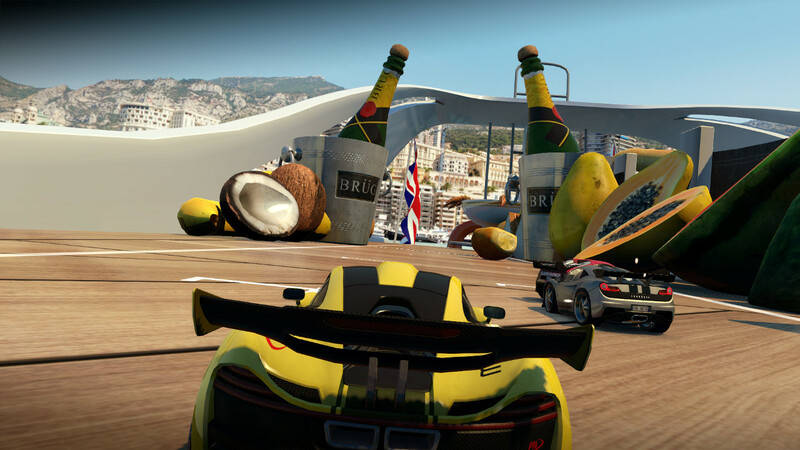 That’s one of the things that quite hard to do is have dynamic objects as well as eight cars in multiplayer. It’s all extra network traffic, but it just had to be. You wouldn’t have it so that if you crash into the bowls and they don’t move anywhere. They’d just become obstacles and that’s not as much fun. You’ve got to consider racing lines. When we talk about the four different routes per track we are also thinking about the speed of the cars. As you unlock the more complicated tracks you are also going up in speed and handling terms. You are then also saying, now we’re unlocking weapons as well. And now you’ve unlocked those weapons, earned this much money you could also buy these wheels that give you a jump facility that allow you to get to new places on the track. You’ve got to layer that into the design. I think when you first lay down the race track you’re looking for opportunities where the rules of the game can exploit the circuit. But it’s only when you actually build it and get your hands dirty and say I really want a shortcut through there but it’s got to be a hard one, or I really want to hide a gold coin in this area but you need jump wheels and turbo to get to it. Layering that into it is really interesting and fun. There’s an awful lot of WipEout history in the development team, isn’t there? NB: Yep, there’s a bit of that. Obviously, I’m the original designer of WipEout, WipEout 2097 and then on the team we have Martin Linklater who worked on WipEout Pure, Paul Ripley who worked on WipEout 2048, HD and HD Fury [plus Dean Ashley – WipEout HD/HD Fury /2048 and Howard Price – WipEout HD]. Because it’s from a Liverpool studio there’s WipEout running through so many of the studios round our way or at least lots of people who have worked on some of it. I sometimes forget myself when we made the first one that the franchise ran for 18 years which we never set out to do. I’m really glad it had a lasting legacy and so many people got to enjoy it and take it into new directions and seeing what they’d done with it. By WipEout Fury you’ve got Zone mode and its incredibly stripped back minimalist pure racing. Amazing. NB: Yeah, obviously it’s not handling with buoyancy, slide and fluidity but as soon as you put it into drift mode on some of these cars you’ll know there’s a bit of WipEout hands at work there. I do most of the car handling and we are refining and tweaking the weapons so that we’ve got a nice blend between using them as attack and as defense. Knowing when to use them is just experience. It takes time to learn how to use the wheel, pickup and super weapons and which cars are best for which track. If you know your cars, you’ll know which ones we’ve meant you to use and then it becomes a real skill based challenge. It’s not on rails. It’s very physics driven. It is hemmed in by walls but in areas within TTR there’s loose walls and track sections you can fall off. With platforms like Twitch and YouTube Gaming, have you also tried to build the game to keep viewers interested? NB: With PS4 you’ve got the share button which you can broadcast on live from PlayStation. We are really excited to see what the community will do with this and watching people master things like drift mode and putting in crazy high scores. There will be shortcuts in there that we don’t know about. There’s going to be methods of play that we haven’t thought of that people will exploit. We just want to see it all online and see what happens. I want people to show me what they can do with the game as TTR 1 showed us what we thought was a great lap time was soon absolutely eroded by the public. They tried things that we wouldn’t try. They think outside the box, come up with new ways of using the weapons and discover things about it that we’ve never discover before. During the online multiplayer races, how are you dealing with rage quitters? NB: If you’re the host and you rage quit unfortunately there’s not a lot we can do about it. 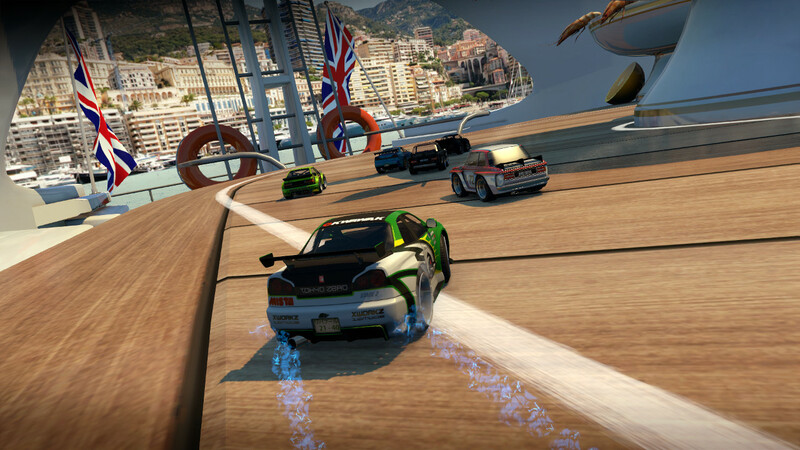 With the type of game that it is, an arcade racer, there’s no long term legacy to your online rating. We aren’t too worried about quitters as it’s not that serious a game. It’s fun to play. You can jump in and the longer the session the more points you’ll score. When you’ve gathered your group of friends together that you love playing TTR with, it gets pretty vicious. If you quit of course and then rejoin at some later stage you’ve got zero points anyway. I saw the article on Street Fighter but they [Capcom] want that long term “where is your position in the world leader board?” We’re only a team of eight people. We can’t really get the game backend together in that sense. If it takes off and it does well and people want to see drift leader boards and other stuff then we can do that. Our plan is to support the game after launch. Launch is only really the start of the next phase. Development is the first phase. Second phase is getting it out there and thirdly it’s listening to what the customers want and responding to it. Give them what they want. 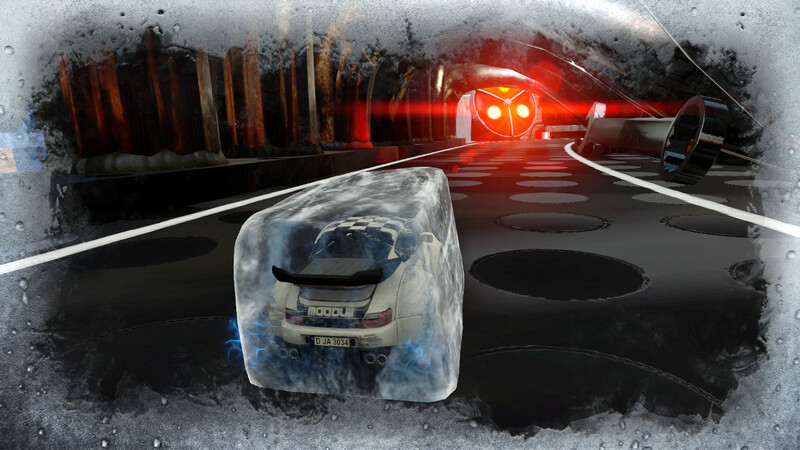 This game harks back to the days of getting your friends together and killing your controller in frustration when you get hit by an ice weapon and slide off the track. NB: The thing that we’ve discovered playing it in the office is that when it happens to you, you do feel like raging, quitting and you are pretty angry about it. You also get to do it back. Revenge and vindictiveness seems to be the thing that drives people to stay in the game [laughs]. It’s like, “Right, I’m having you on the next race” and we kind of like that as that’s how we used to feel about Micro Machines. Also it’s difficult for one person to dominate race after race after race. We’ve all been playing it for a year and we are not bored of it, just getting better at it and still learning more about how the weapon timing works. It’s great fun. Tripping each other up, freezing it other on a bit where you can fall of the track. You need to think about the track design and where to use these weapons. Loads of people are dropping mines around blind corners or acid pools and some approaches with jump wheels on and just jumps over it anyway. There’s lots of different ways of dealing with all the different weapons. It’s good fun.